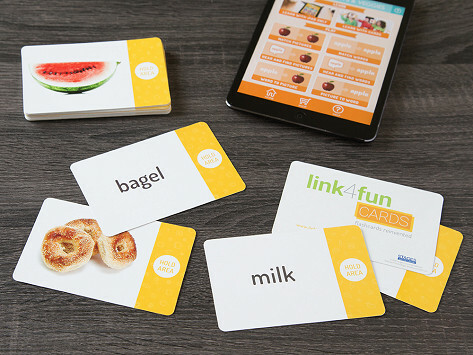 This set of kids’ flashcards bridges physical and digital learning. Embedded technology connects the cards to the Link4Fun iPad app. By tapping the tablet screen with the cards, kids are immersed in a fun new (and interactive) way to learn that blends watching, listening, and touching. Dimensions (Each): 5.25" x 3.5" x 0.56"
Fun fact: kids learn better when their busy hands are involved. Which is why Link4Fun combines physical play with screen time in connected kids’ flashcards, books, blocks, and games. Embedded technology built inside connects to apps on an iPad. 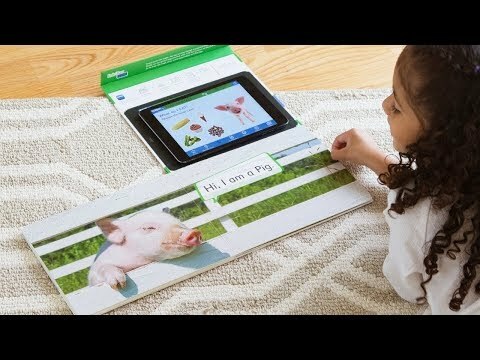 By placing the tablet on the open book, or tapping a card on the screen, kids are immersed in a fun new way to learn that blends watching, listening, and touching. Founder Angela Nelson is a behavioral therapist who developed the system after years of making her own teaching materials for working with children. Her approach to learning numbers, letters, and even animal sounds helps kids better absorb these subjects—and it’s lots of fun, too.